As exciting as this “ever-increasing universe of technology” is, it can also be overwhelming. So to help AEC professionals cut through the clutter, in a webcast called, “7 Hot Products to Save Time and Money on a Jobsite,” ARC’s Kevin Leatham and Nick Miller presented the hottest products that construction professionals are using to save time and money on the jobsite. You can view the webcast here, or keep reading for a quick recap of each product covered in the webcast. Mobile apps have connected the world in previously unimaginable ways, and now they’re doing the same thing for the jobsite. 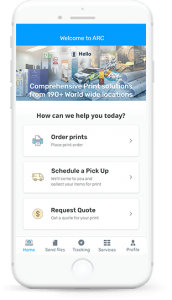 The ARC Print app connects you to ARC’s 190+ print locations through the United States which means you’ll never have to deal with the hassle of finding a local large format printer if you’re working remotely. With the ARC Print app, AEC professionals can order prints, request quotes, and track their print jobs from the convenience of their mobile device. Anything you can do on a computer, you can do on a SmartScreen. But until the SmartScreen came about, bringing a large, touch-screen computer onto a dangerous job site was a sure way to destroy it. Fortunately, these screens are durable and built to withstand the rigors of construction sites so that AEC professionals can enjoy the benefits of improved collaboration and productivity. Swinerton Builders actually joined ARC on another on-demand webcast to explain how they’re using a Digital Storefront (DSF) and the efficiencies it brings to their business. And even though we already discussed it there, the consistent brand management, simplified vendor and inventory management, and streamlined distribution are worth mentioning again. From regional companies to international powerhouses, construction companies throughout the nation have set up a Digital Storefront. Anyone who’s spent anytime in the AEC industry knows that minimizing RFIs and rework must be a top priority on every project. And that’s why so many construction professionals are using linking services to mitigate project risk and free up their time for more proactive planning. Of course, it also helps that—as Kevin Leatham pointed out in the webcast—linking is a product which provides real cost savings and ROI very quickly. Linking is so effective because it eliminates the time you would usually spend flipping through drawing sets by linking every project document together. Plus, with ARC, this service can be provided on an as-needed basis by industry experts, whether the project just started or you’re trying to catch up. For most in the AEC industry, the administrative workload associated with managing project-related documentation is a huge challenge. SKYSITE, a cloud-based document management software specifically designed for AEC professionals, makes managing project information easy. This is a hot product among construction firms because it has built-in project management tools, enables real-time access to project changes, keeps all team members connected with or without WiFi, and it works well with other technologies such as SmartScreens and Linking. The commercial use of drones has grown in great numbers the past few years, and the AEC industry is one of the biggest drivers of that growth. 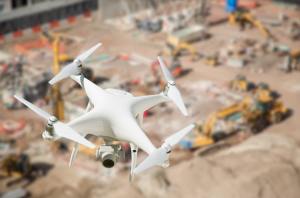 Construction firms across the nation are realizing the benefits of using drones for tracking job progress, assessing site conditions, safety inspections, marketing, and much more. In fact, ARC caught up with AvalonBay Communities, a large apartment developer, to talk about how and why they used ARC’s Drone Services for reliable, monthly project summary reports. Beyond the efficiency of the drones themselves, using a single provider with a nationwide reach like ARC enables construction companies of all sizes to deploy drones safely, in legal compliance, and at scale. Nick Miller posed this question: Why do we start projects with 3D models and then close them out by handing the owner rolls of paper? In the past, it was the only choice, but with closeout solutions that create a clickable dashboard containing all your closeout information, closing a project out with paper doesn’t make sense anymore. Beyond the convenience for construction professionals and added value for owners, these closeout solutions are allowing contractors to deliver projects quicker, which greatly improves cash flow. If you’re wondering where to get started with all these great technologies, so were some of the audience members. With seven hot products that can all transform your jobsite productivity, it’s a valid question. Kevin explained that the ARC Print app is a great spot to start because it can act as a hub, connecting you to the rest of ARC’s services. So give it try by visiting the App Store (coming soon to Google Play) or find out more about how the ARC Print app can save you time and money on the job site.